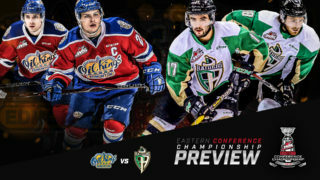 RAIDER REVIEW: The Raiders (20-1-0-0) are back on home ice tonight when the Lethbridge Hurricanes (9-7-2-2) make their first trip to Prince Albert this season. 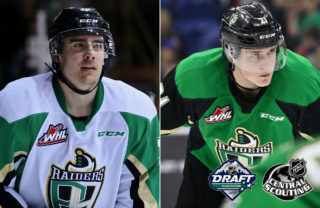 In their last outing, the Raiders rolled to a 6-0 win over the Wheat Kings in Brandon on Saturday night. Four of those goals came via special teams, with Sean Montgomery leading the way with a pair of power-play goals. Carson Miller also struck on the power play, while Noah Gregor added a shorthanded goal. Cole Fonstad and Brett Leason also found the back of the net. Sergei Sapego chipped in three assists in the contest. In goal, Ian Scott made 26 saves for his fourth shutout of the year. VS. LETHBRIDGE: This is the second meeting of the year between the Raiders and the Hurricanes. 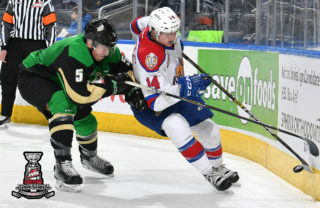 In the first contest, the Raiders skated to a 5-1 win over Lethbridge at the Enmax Centre. Ian Scott made 35 saves in the win, while Noah Gregor notched two shorthanded goals. WHL AWARD: For the third time this season, Ian Scott was named the WHL Eli Wilson Goaltending Goaltender of the Week. The Toronto Maple Leafs prospect finished the week with a 3-0 record, two shutouts, a 0.33 goals-against average and a goal scored. Scott currently leads the entire CHL in goals-against average (1.39), save percentage (0.950), and shutouts (4), and is tied for the CHL lead in wins with 17. SLUMP BUSTER: Winger Cole Fonstad got the monkey off his back on Saturday night in Brandon. 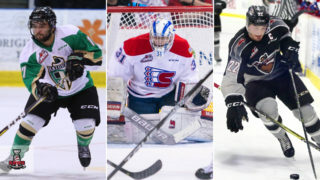 The Montreal Canadiens prospect scored his first goal in 13 games, dating back to Oct. 5’s matchup against the Lethbridge Hurricanes. 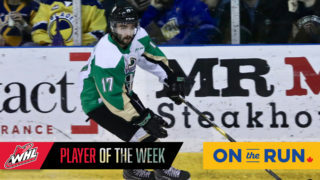 This season, the Estevan product has six goals and nine assists in 21 games this season. NEXT UP: The Raiders hit the road for seven consecutive games, beginning on Friday night in Medicine Hat against the Tigers (10-11-1-2) on Friday night at the Canalta Centre. 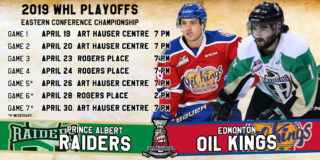 The next Raiders’ home game is on Saturday, Dec. 8 against the Brandon Wheat Kings. Puck drop is 7 p.m. Tickets are available at the Raider Office and raiderhockey.com.